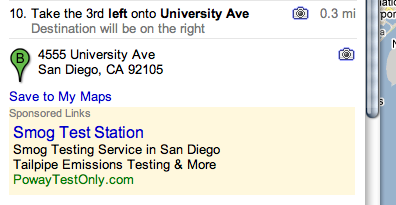 Mimsy: Google Maps location-sensitive ads? 4555 University Avenue is not Poway Test Only, it’s Dan’s Smog Check. It could have been random; I just now asked for directions to a luggage store and got an appliance ad, which doesn’t make sense; but directions to a record store’s address brought me an ad to go to a digital sound design school. The record store’s name has “record” in it (Record City in San Diego). On the other hand, it’s not nearly as specific of a placement as one test-only smog check station advertising under the address of another test-only smog check station. Dan’s Smog Check Station was recommended to me years ago by my mechanic. I think the smog check system as it currently stands in California is pointless except as one more fee for driving (ten percent of my driving this year was for the purpose of getting my car smogged), but Dan’s has been a pleasant part of the process. If you want me to watch your web advertisements, don’t advertise with ad servers or web sites that display obnoxious ads. Google Maps location-sensitive ads? last modified November 22nd, 2009.